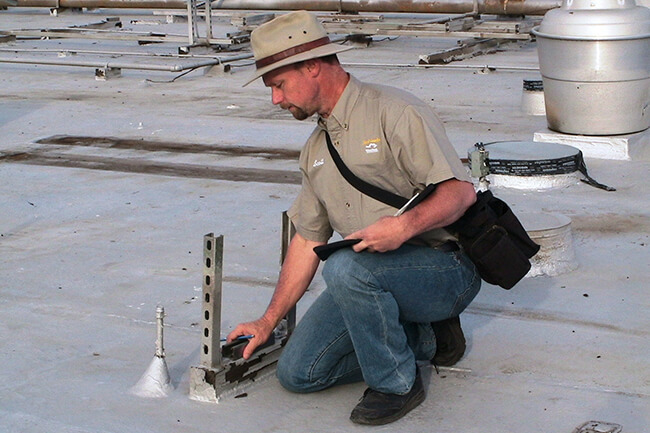 When companies need roof assessments in the SF Bay Area, they trust the team at Just Leaks. We specialize in commercial roofs and industrial roofs. We possess the expertise, education, and equipment to quickly and accurately assess your roof. Just Leaks is a trusted roof assessment specialist for many commercial building owners and property managers in the San Jose / Silicon Valley region. For many of our clients, composing and presenting a roof condition report is the first service we provide. Our reports are incredibly detailed and thorough, providing our customers with a clear understanding of a roof’s present condition and expected performance. Each roof condition report contains information on general roof conditions, as well as specific defects with detailed recommendations for repair when necessary. The roof condition report also contains photographs of the roof to illustrate each issue. Roof assessments may also include a video and roof map to portray complicated issues better. Although our reports are certainly valuable, we do not charge a fee for them. We consider the report to be a foundation for a clear understanding between Just Leaks and the facility engineer or property manager. We take pride in the fantastic reputation that we have earned among clients in San Jose. Take a look at this recent 5-star review from Alex Z. Just Leaks provides tailored, experienced, and reliable roofing service to commercial and industrial operations throughout San Jose and the SF Bay Area. We are committed to repairing your roof quickly and accurately. Because of our diligence to our clients, we are proud to have earned the reputation as the leading commercial roofing company in San Jose. To schedule an appointment for a free estimate, call Just Leaks at (408) 249-4646.